Edited by Raymond Krediet . 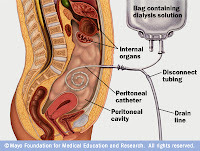 Continuous peritoneal dialysis was first introduced by Popovich and Moncrief in 1976. It gained popularity as a form of home dialysis in the eighties in Canada, USA, Western Europe and Hong-Kong. Since the nineties Eastern Europe followed and from 2000 onward the main growth was in the so-called third-world countries. As a consequence, the level at which peritoneal is practiced differs very much amongst countries. This translates into research that is focused either on in-vitro studies, some studies in animals, mathematics and, most-importantly, clinical studies in patients. This makes the scope of interest in peritoneal dialysis related studies very wide. The aim of the present publication was not to create a comprehensive reference book on all aspects of peritoneal dialysis with invited authors, recognized as authorities in part of the field. Rather, the objective was to make a collection of various actual subjects, highlighted by authors from all over the world, who had shown their interest in a specific item by submitting an abstract. These abstracts were reviewed and chosen based on the quality of their contents. The chapters which emerged reflect the worldwide progress in peritoneal dialysis during the last years. Five of the twelve chapters comprise clinical issues, two are on kinetic modelling, and the others show the results of the mainly in-vitro studies of the authors and their collaborators. Consequently the interested reader is likely to find state-of the art essays on the subject of his/her interest. I hope this book on Progression in peritoneal dialysis will contribute to spreading the knowledge in this interesting, but underused modality of renal replacement therapy.